The Eastern Cape’s largest shopping centre, the R2-billion Baywest Mall in Port Elizabeth, is part of an increasing movement by companies which are going high-tech in a bid to tap into the coveted youth market. Marketing manager Christopher Hutchings said that the mall was changing its marketing strategy and instead of running singular campaigns to be “something to everyone”, separate marketing campaigns were being created to celebrate the diversity of the mall’s patrons. This was especially true when focusing on attracting the attention of the youth market – a coveted segment for major brands – while running separate campaigns to appeal to other valued shoppers, he said. The country’s youth market – categorised as eight to 23-year-olds – is estimated to be worth R111-billion. Hutchings said the mall was focusing on tech-savvy youths by running a social media campaign on Instagram and Facebook, using the unique Baywest Mall app. 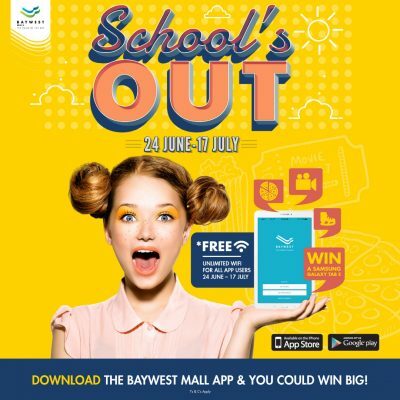 The campaign calls on youths to download the Baywest Mall app and in return enjoy unlimited Wi-Fi Internet access at the mall during the school holidays, in doing so standing a chance at winning a Samsung Galaxy Tab E or an all-expenses-paid day out at the mall with friends. Hutchings, who together with general manager Troy Zunckel took up position at the mall earlier this year, said that given the mall’s diversity of shoppers, a single marketing campaign could not be “something to everyone”. Instead, the mall is focusing on running various marketing campaigns concurrently, to appeal to a broad range of shoppers. To this end, the mall has also launched a Best Dressed Babe competition, as well as various fashion-oriented #Spend2Win campaigns. “For us, the days of doing things in the same way just because it worked in the past are over. As data rates drop throughout South Africa and especially with the mall offering 1GB of data to Baywest Mall app users at each visit, we need to start communicating in the digital spaces where we’ll find our shoppers – and a lot of that is on social media,” Hutchings said. Social media video campaigns would also be created to drive interest in the mall, said Hutchings. “While we most certainly will continue our relationship with traditional media houses, we are increasingly cognisant of the importance of social media in today’s marketing landscape,” he said.